Rada Cutlery was founded in 1948 and have earned the reputation of remarkable quality and value of their products. All of their products are made right here in the U.S.. Rada Cutlery has helped many of thousands of schools, churches, youth groups by raising money selling Rada Cutlery. To see more about Rada Cutlery and some of their products read Simply Southern Couponers full review here. 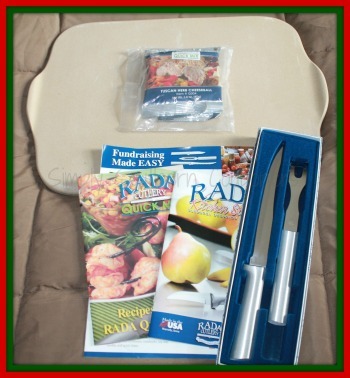 Simply Southern Couponers has teamed up with Rada Cutlery to bring you this amazing giveaway!! We are giving one lucky reader a chance to win a Stoneware Cookie Sheet, 2-pc Carving Gift Set and a Tuscan Herb Cheeseball mix from Rada Cutlery for your Holiday baking. Tales From A Southern Mom is excited to be a co-host for this giveaway! It is the perfect time with the holidays coming up to have a new set of Carving Knives, Stoneware Cookie Sheet and Tuscan Herb Cheeseball for Thanksgiving or Christmas gatherings. To enter for your chance to win read below. Open to US residents only, Must be 18+ to enter. Next post: Love Cookies?? Enter To Win A Sampler Box From Country Cupboard Cookies!! Ends 11/26!! Getting together with family is my favorite. I love the yummy food and Christmas decorations. My favorite thing about the holidays would be getting together with friends and family and really talking to them and of course the food . I love the family time. I love everything about the holidays! I guess my favorite part is being near my family. We’ve spread out a lot over the years, its nice to get together again! I love baking holiday treats and spending time having fun with my husband and little girls.